The briefing highlights the key safeguarding issues, challenges and implications for practice that have emerged from analysis of the SCRs for those working in health services. It is intended for use by frontline health practitioners, in both personal and team development. As well as supporting individuals and teams to develop their understanding of the issues and the implications for practice, it can also be used to generate discussion and planning about ways in which the learning can be applied within your service and across your agency. It is for all health practitioners and their managers who work with children, young people and their families, including those in adult services providing care to parents and carers. Key roles include general practitioners, health visitors, midwives, school nurses, CAMHS teams, adult mental health teams, community children’s nurses, specialist children’s nurses, community (children’s) dental teams, sexual health nursing teams, Public Health teams working with children, paediatricians and nurses. It will also be of interest to those with a specific remit on safeguarding, quality assurance, learning and development or commissioning – for example, Commissioners and CCG Quality Directorate Teams, Directors of Nursing, Safeguarding Professionals such as Designated/Named Doctors and members of Child Death Overview Panels and LSCBs. The report is based on a quantitative analysis of 293 SCRs relating to incidents that occurred between 1 April 2011 and 31 March 2014, and analysis of a sub-set of 175 SCRs (providing quantitative and qualitative data) for which SCR final reports were available (66 representative SCR final reports were also selected for further detailed qualitative analysis). The full report and a short presentation with audio on the methodology for analysis are available at: https://seriouscasereviews.rip.org.uk/resources/. These factors appear to interact with each other, creating cumulative levels of risk the more are present (p77). Some factors such as domestic abuse are always harmful to children. Others, such as parental mental health problems, do not necessarily indicate risk of harm (p84) and must be considered on a case-by-case basis. Other potential risk factors include young parenthood (p73), maternal ambivalence about pregnancy and poor ante-natal engagement (p74) and large family size (p75). Additional factors include poor housing (p87), transient lifestyles (p88) and social isolation (p88), which can be a particular issue for immigrant families. When presented with any of these risk factors, some of which are discussed in detail below, health practitioners should explore whether there may be other and potentially cumulative risks of harm to the child. All health practitioners and services need to be particularly vigilant to the impact of cumulative harm of neglect over time and of escalating risks. As in previous national analyses, domestic abuse was found to have been highly prevalent in these SCRs – featuring in over 50% of cases between 2011 and 2014. The report emphasises that disclosure is often seriously inhibited by perpetrators’ coercive and controlling behaviour. Health practitioners and services must offer repeated opportunities to disclose and in a safe, trusted environment. Practitioners need to be mindful that controlling behaviour, abuse and violence typically continues following separation, and often extends to issues around contact with children. In some cases it was restrictions placed on the father’s contact, or the fear of that, that appeared to be the trigger for the fatal incident (p79). … did not follow up with any further advice or make enquiries with any other agency about what more specialist help could be offered to the family, and especially to address any needs that the children might have in the situation… The mother explained in her contribution to the SCR that the GP had been supportive but that she nevertheless felt very isolated at this time and didn’t know how to resolve the situation or whether to leave her husband (p150). While the vast majority of domestic violence perpetrators are male, coercive and/or violent behaviour may also be exhibited by women, or by both partners in a relationship. 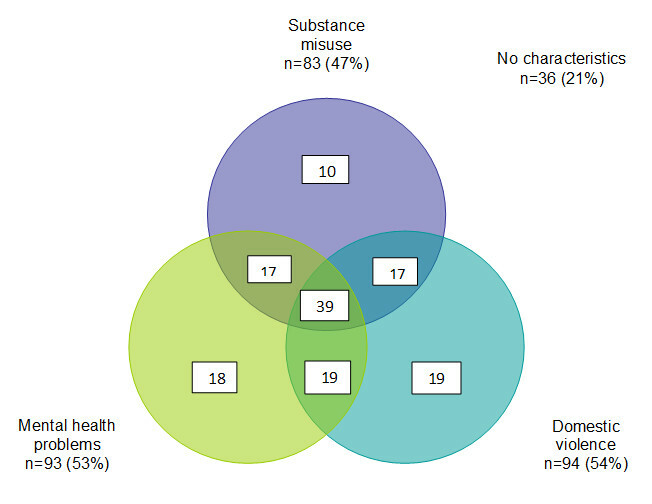 The Venn diagram below shows the overlap of three factors (domestic abuse, substance misuse, and mental health problems) within the subset of 175 families. It is worth noting that there were 36 families (21% of the 175) where none of the three problems were recorded as being present. Parental alcohol and drug misuse were both recorded as present in over a third of SCR final reports (37% and 38% respectively), with at least one of these in almost half (47%) of cases. Practitioners working with adults with substance misuse problems – including in primary care teams and in specialist alcohol and substance misuse services – must be alert to the possibility that their clients have parenting responsibilities so that the impact on their children may be assessed. Equally, practitioners who are working with children and families must remain alert to the needs of parents who may have issues with alcohol or substance misuse – and the potential risks for children of not doing so. In one case in which a child died following methadone ingestion, there was no indication that the mother had been offered any support related to her increased use of alcohol and heroin. Many of the cases specifically indicated mental health problems in the mother, father, or both. However, unlike domestic abuse, which is always harmful to children and a form of maltreatment in its own right (p77), the presence of parental mental health problems does not, in and of itself indicate risk of harm to the children (p84). … In these cases, there were always other factors that indicated that the child may be at risk, whether it was the extreme nature of the parental mental health problems, expressed suicidal intent, or intent to harm the child; the co-existence of mental health problems with domestic abuse or substance misuse; or wider family and environmental factors such as social isolation (p84). The severity and impact of mental health problems should be considered alongside these other factors. In particular, any escalation of behaviours, such as expressed suicidal intent or intent to harm the child, should instigate an urgent risk assessment of the child’s safety. The co-existence of parental mental health problems with domestic abuse, substance misuse or wider environmental factors (eg, social isolation) must be included in any assessment of risk. Practitioners should bear in mind that any bereavement, loss or threat of loss may lead to increased parental vulnerability and stress, which may be a trigger point for harm to a child. In many cases where the mother was the alleged perpetrator of harm, there was evidence of significant mental health problems and of the mother not coping with both her own needs and her parenting responsibilities. In most cases involving fathers as perpetrators, there were indications of paternal mental health problems interacting with known violent behaviour or a previous criminal record. In order to ensure opportunities for prevention are not missed, those working with adults with mental health difficulties (including GPs and midwives, as well as mental health workers) must enquire about whether the person has contact with or care for children (p137). Particular difficulties may arise when an adult later acquires access to or responsibilities for children. Perinatal services are particularly well placed to ensure that pregnant women with mental health needs receive appropriate assessment and support. In one case, a 17-year-old attended an early pregnancy assessment unit. Although the casualty card indicated a history of schizophrenia, there was no evidence this was explored by the nursing, obstetric and gynaecology staff. This represents a missed opportunity to explore mother’s mental health … The limited assessment also precluded referral to other agencies, such as mental health, who could have supported a positive outcome to the pregnancy and the parenting of the baby once born (p138). The report provides evidence of the additional pressures that young motherhood may bring to the task of caring for a baby or young child. In a sub-set of SCRs where the family had only one child and the age of the mother was known, 54% of mothers were aged 19 or under. Issues raised in the SCRs include denial of pregnancy and concealed birth, estrangement from the mother’s own parents, poor or unstable housing, and a poor relationship with the baby’s father. More positively, good practice was often identified in the work that the teenage pregnancy midwifery teams could provide to the first time teenage mothers in offering them a targeted level of support (p74). Maternal ambivalence (both during and after pregnancy) was highlighted as a potential indicator of a child’s vulnerability. At its extreme, ambivalence may present with a concealed or denied pregnancy. Other presentations are far more common and might include an unwanted pregnancy, ambivalent feelings about being pregnant, delayed antenatal booking or non-engagement with antenatal services. Later presentations included an apparent lack of joy or expressed warmth towards the child; feeding and bonding difficulties; or poor engagement with services such as routine child health surveillance or post-natal classes (p74 and p147-8). Such presentations provide midwives, health visitors and GPs with opportunities to explore with the mother the reasons underlying such ambivalence; possible medical issues such as depression or anxiety; past experiences; and potential external pressures such as from controlling partners or relatives. When true ambivalent feelings are detected, these warrant a fuller assessment focusing on the child’s needs; potential risks; existing support structures; and additional support needs. Extreme maternal ambivalence or its combination with other risks would warrant case escalation to children’s social care (p148). Families living transient lifestyles, ‘with frequent moves and little sense of attachment to any geographical location or community’, featured in several SCRs. Numerous moves and a transient lifestyle often overlapped with a context of multiple, often violent partners, and create a damaging environment for children, who are isolated from any community of wider family support. Frequent changes of practitioners involved in multiple moves can also affect children’s visibility. Health practitioners (including midwives and health visitors) should be alert to the need to pass information swiftly to colleagues when an expectant or new mother moves out of their area, ideally with a phone call or face to face meeting in addition to written information where concerns exist. For children and young people in care experiencing placement moves there is a particular need to keep health service history (including A&E presentations) up to date. Some families described in SCRs were very isolated from wider family and community and, as a consequence, little had been understood about their children’s lives. For infants, a full Family Health Needs Assessment by the Health Visiting Service should ensure a picture is built about the living circumstances for each child. Alongside an assessment of parenting capacity, family health and environmental factors should be assessed to identify children and families who may require additional support. Professionals should be alert to the social networks available to parents with whom they are working and where a family appears to be socially isolated, this should prompt an appraisal of the safety and wellbeing of the children in that family. Social isolation – this was an issue for a number of families in the SCRS, ‘where mothers in particular appeared to be relatively cut off from the community and sources of support’ (p89). Lack of a shared language. Interpreters may well be necessary to help practitioners ‘fully assess the needs of the family and to identify explicit and implicit safeguarding issues’ (p90). Other issues include disrupted attachment, difficulties in accessing information about individuals and families across countries. Restrictions on benefit entitlements and housing problems create stresses, ‘adding to poverty and undermining the health and safety of the children’ (p87). It is important that health practitioners are aware of culturally appropriate services in their area and are able to ‘signpost’ immigrant families appropriately. Two age groups stand out as being particularly vulnerable to suffering serious harm as a result of child maltreatment: infants and adolescents. Both deserve particular attention from health and other practitioners ‘to address their vulnerability and minimise the risks of serious harm’ (p69). Babies and very young children are inherently vulnerable and dependent on their carers: 120 of the 293 children (41%) who were subject to SCRs were aged under 12 months at the time of their death, or incident of serious harm; and nearly half of these (43%) were less than three months old. Some factors make infants especially fragile and place them at higher risk of abuse and neglect – for example, premature and low birth weight babies and those requiring special care because of illness, and babies born with neonatal abstinence syndrome as a result of maternal drug misuse in pregnancy (p69). These issues potentially pose challenges to their parents over and above the demands of a normal birth weight infant. There were 31 cases of sudden unexpected deaths in infancy (SUDI) during the review period, relating to children aged 0-19 months. In many families, there were long-standing issues of neglect relating to the child or siblings and most of the infants (81%) were known to children’s social care. ‘Many of these families appear to have led chaotic lives, with frequent house moves, periods of homelessness, or inappropriate housing. Substance and alcohol misuse was common, as were parental mental health concerns’ (p59). Deaths due to co-sleeping were related to infants sleeping with a parent and/or in other dangerous sleeping arrangements, such as on a sofa or soft bedding. Universal services have a vital role to play in ensuring the availability of information regarding association between co-sleeping and SUDI and to share this information with parents and carers. One in four (24%) of the fatal SCRs related to children who had died from fatal physical abuse; nearly three-quarters (73%) of these children were under two years old. In the majority of cases, the cause of death was a severe non-accidental head injury, from suspected shaking or shaking-impact injuries. ‘Most notable are the risks presented through situations of domestic abuse, particularly when this is in a context of a young or immature mother, or one who has ambivalent feelings to her child, and perhaps exacerbated through a transient or chaotic lifestyle with multiple partners, frequent house moves or overall social isolation’ (p56). It is this combination of multiple risks, coming together in a family with a young infant, which provides health and other practitioners with opportunities for recognition of risk and preventive intervention. The report looks in detail at 17 SCRs relating to young suicides in the 11-18 age group and the seven SCRs relating to or with elements of child sexual exploitation (CSE), ‘two growing areas of concern’ (p99). Loss and rejection were common threads in lives characterised by parental conflict and separation, domestic abuse and parental substance misuse. In one in three cases, the young person had spent time in care, a young offender institution or a Tier 4 mental health unit. Almost half the SCRs recounted instances of the young person going missing, which often indicated ‘a sense of hopelessness and a lack of control’ (p107). Feelings of hopelessness and isolation were often compounded by school absence and exclusion. Some young people had taken on the role of being a young carer, but the strain of the role was not always adequately recognised. One young carer was discharged from CAMHS ‘in spite of clear vulnerabilities … and with no resolution of the problems’ he was facing (p107). In all but two of the 17 suicide cases examined in detail the young person was involved with CAMHS. For some young people, mental health problems had developed relatively quickly (over months); however, most had displayed behaviour indicative of underlying mental health issues over a much longer period of time. This indicates ‘how important it is to take seriously changes in behaviour and expressions of suicidal ideation’ (p103). ‘Their problems included delusions, psychosis, depression, anxiety, anger, ADHD and other behavioural difficulties, personality disorder and conduct disorder’ (p111). While it may not always have been possible to foresee that a young person’s life would end in suicide, there were ‘many indicators of the high risk of serious harm to themselves and therefore a clear need for more sustained support’ (p110). Opportunities for prevention did arise at different times for health and other practitioners, but in order to adequately protect against and prevent suicides, multi-agency work is required, with an emphasis on relationship based practice. This should be ‘consistent, holistic and available over a long period of time’, preferably on the young person’s own terms (p119). Self-harm and/or suicide attempts preceded all but one of the suicides ‘and should be taken seriously whenever they occur’ (p119). Agencies losing sight of young people’s vulnerability and making assumptions about their own ability to remove themselves from harm was a common feature of SCRs involving CSE. The impact of CSE was often ‘missed or misunderstood’ by practitioners and overall there was ‘a lack of understanding by professionals of the dynamics and prevalence of CSE’ (p123). A common theme was young people demonstrating ‘disruptive, sometimes sexualised, often challenging and occasionally intimidating behaviour’ (p124), which was misinterpreted by practitioners. In one case, sexual health workers were the first practitioners to ‘name’ what was happening, but children’s social care ‘concluded that no strategy meeting or assessment was necessary nor was any action required other than offering support’ (p124). Practitioners from all agencies need to recognise and act upon the signs of vulnerability to risk taking behaviours including sexual exploitation. Signs of vulnerability should trigger a full assessment of the young person’s history and what is informing their current behaviour. Children with disabilities and additional needs are particularly vulnerable to abuse and neglect. It is possible that additional health needs may cause added stresses on the parents and carers. There are greater demands practically, emotionally and financially. There may be a lack of consideration given to the impact of the impairment or chronic illness on how the family functions. Signs of abuse or neglect may also be mistakenly attributed to a child’s disability or health needs: ‘… physical injuries, challenging behaviours, developmental delays, poor growth, and unhygienic living conditions can all be left unchallenged or attributed to the child’s disability rather than identified as symptomatic of abuse or chronic neglect’ (p70-71). In some cases this may be compounded by parents actively giving misleading presentation in order to deflect attention from safeguarding concerns. Health practitioners working with disabled children need to remain alert to the possibility of maltreatment and consider this possibility when a child presents with signs and symptoms that might be considered indictors of abuse or neglect in a non-disabled child. It is important that training supports practitioners to understand thresholds and how to articulate identified risk/s clearly. The report highlights that an initial referral to statutory child protection agencies must clearly outline what the concerns are in order to ensure an appropriate response. General supervision for child safeguarding concerns is also recommended for health practitioners (p231). The report emphasises the importance of authoritative practice and professional curiosity in responding to the ‘often highly complex cases, with multiple risks and vulnerabilities, often extending over considerable periods of time’ that are characteristic of SCRs (p203). An important aspect of authoritative practice is that every practitioner ‘takes responsibility for their role in the safeguarding process’ (p205). Encouraging all health practitioners to take responsibility for their role in safeguarding process, while respecting and valuing the role of others. 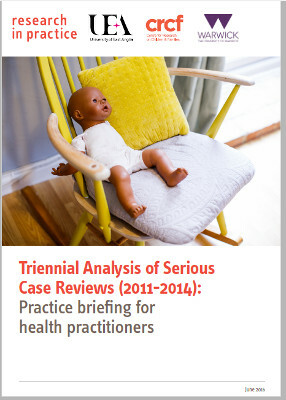 Allowing practitioners to exercise their professional judgement in the light of the circumstances of a particular case (the report highlights as an example of good practice a case in which a midwife made a referral to MARAC on the basis of her professional judgment, despite the assessment being below the standard threshold; the subsequent risk assessment was classified as high – p204). Encouraging a stance of professional curiosity and challenge from a supportive base. In a large number of SCRs where the child died of a medical cause, there was evidence of poor parental engagement with health and social care services. Parents who do not engage present a challenge to professionals, ‘but this challenge also provides an opportunity for protection’ (p145). When working with vulnerable families, health practitioners and services should maintain ‘consistent support for the family’ and ‘vigilance towards meeting children’s needs’ – and be persistent in pursuing non-engagement (p149). Non-compliance may be a parent’s choice, but it is not the child’s: ‘Any non-engagement with services that are central to a child’s welfare should be seen as carrying potential harm for the child’ (p147). ‘The practice generally made efforts to ensure she would be seen, even when she was late or failed appointments; this approach was signified by a flag on the system to give her ‘priority appointments’ whenever she did manage to attend’ (p146). The report highlights also the potentially serious risks in services rigidly following bureaucratic procedures. In one case, a GP practice removed a mother and her children from the register after persistent failure to bring the children to routine appointments, including immunisations. Had the child been seen by a GP prior to being removed from the register ‘it would of course have been an opportunity for evidence about the extent of malnourishment that contributed to the death’ (p197). The authors propose that a shift away from the term DNA (did not attend) to WNB (was not brought) would help ‘maintain a focus on the child’s ongoing vulnerability and dependence, and the carers’ responsibilities to prioritise the child’s needs’ (p147). The centrality of information sharing to effective child safeguarding ‘cannot be stressed enough’; it is vital all practitioners, including those for whom safeguarding is not a core responsibility, ‘are aware of the need to share information early’ (p166). ‘… presume that any information that has a bearing on child welfare should be shared with other professionals unless there is reason not to. As such, the onus would be on the professional to make an active decision not to share information and to document their reasoning’ (p167). Complex and often fragmented primary care delivery, with numerous different professionals working in relative isolation, is noted in a number of SCRS. GPs working as independent practitioners in multi-disciplinary teams including practice staff, health visitors, midwives and school nurses (many of whom would be located elsewhere and under different employment structures) brings substantial challenges to effective safeguarding practice. There are many transition points inherent in the provision of primary care and universal services, such as those between GPs, midwifery, health visiting and school nursing. Fragmented delivery structures will require creative discussion at a local level to enable effective sharing of information and transition between different providers of care. Given that all children are, or should be, registered with a GP they potentially provide a central repository of information, and a bridge between community services and secondary/tertiary care. However, it is important that this role isn’t accorded undue weight, or that unrealistic expectations are placed on GPs in this regard. The fact that general practitioners are essentially autonomous independent practitioners causes a lot of concern among safeguarding professionals. This, combined with the huge remit of general practice, means that there are inevitably wide variations in the degree of engagement by GPs in safeguarding processes. The authors suggest there is a need for a deeper consultation at local levels between GPs, their commissioners, secondary health services and other agencies as to what expectations can realistically be placed on GPs as central repositories and coordinators of care, and how any expectations can be effectively supported by robust structures and processes. Complexity and fragmentation is potentially even more of an issue in relation to secondary care health services and in the interplay between primary and secondary care. Navigating complex agency structures can be difficult for professionals and families alike and these issues were graphically illustrated in a number of SCRs. Complexity in services arises where individual organisations, such as health trusts, GP practices, or individual schools provide related services under different umbrellas or management systems. This complexity can be at least partially mitigated by developing clear, coordinated care pathways for particular circumstances of vulnerability. Such pathways can go a long way towards ensuring that parents, children and families receive the care and support they need in a timely fashion. Systems for review and updating care pathways are essential, particularly when underlying structures change. Opportunities exist within all health and welfare services for clear signposting towards appropriate services and clear criteria for referral and acceptance/rejection of cases.